Puzzle games are hard to invent. For every Lumines, Tetris, or Jenga, there have been exponentially more failures. Really though, just try to think of something that is truly "new" as far as puzzle games go. If you actually were able to come up with something perhaps it's time to buy that suit and start selling that there idea. Because puzzle games are a tricky, sorry for the pun, genre to invent, it is no wonder that there are often so many clones of a game that is successful. Or, if they aren't clones they are just themed or licensed versions of the same thing (it's only a matter of time until we see Star Wars Lumines, hear you me). Puzzle Scape is mostly the former, not a complete clone of the well known Lumines, but similar enough that the comparison is inevitable, while different enough to make it a title that shouldn't be ignored. Puzzle Scape's goal is to combine similarly colored blocks into groupings of 2X2 squares while keeping the blocks from going above the top line. 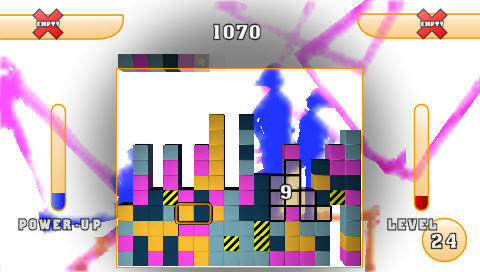 Players accomplish this task by moving adjacent blocks to the left or right after they have fallen in a Tetris-esque fashion. Once these squares have been formed a short time passes until they explode. Any blocks that are touching the 2X2 square that are of the same color will also be set off to explode, allowing for players to chain a large number of blocks of a single larger grouping. 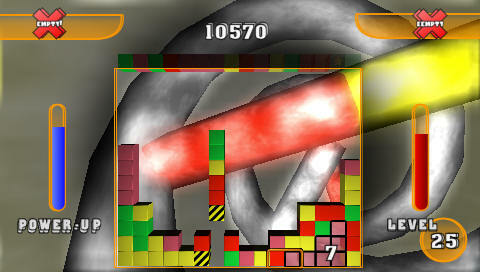 Furthermore, if the player is fast enough, they can quickly switch similarly colored blocks into a position where they are touching the soon to be destroyed blocks; each time the player links a new block during the pre-explosion period it gives them just a second more to add yet another, continuing on until the player is either too slow or there are no other blocks to add. The more blocks you destroy, the faster you level up. Beyond the core of the gameplay, the destruction of blocks in order to survive and level up, players are also working to create the "scenes" behind the game board. The board starts off with a colored background behind it but starts adding 3D imagery as the player progresses through levels. On one level there was at first just a color, then a 3D ball, and then as the levels progressed the ball gained cones, tentacles, and started to expel gases. It may not be that compelling, but it does give you some sort of tangible feeling of progression. If that isn't enough to make you want to create 3D images via puzzle gaming, then perhaps the fact that you can save the final images, and use them for PSP backgrounds, will be. That's right, Puzzle Scape allows you to save the final "scene" and use it as a background image. Nerdy? Yes, but it does help make the game a little more goal driven for the completists out there. Puzzle Scape has two types of gameplay: Artist and Architect. Artist mode is like classic Tetris, with the only goal being to see how long the player can level up without failing, while Architect has the player trying to finish a set number of specific goals, such as clearing only specifically colored blocks, during a set amount of time. Players are awarded a Gold, Silver, or Bronze metal depending on how fast they accomplish the goals in Architect. Players also have to unlock each "scene" to progress to the next one. The multiplayer situation is pretty abysmal. Not that the games are that bad, but they require that everyone has a copy of the game. Should you find enough people to play multiplayer, which we could not, then you will be able to play either co-op or versus. Puzzle Scape is not a great game, but is a game that should be purchased by enthusiasts only. If you are in the market for a puzzle game or know someone who is, then Puzzle Scape might be the way to go. It's fun, for a while, and has some really good music, but in the end this is one title that you might want to wait for a lower price point. What's Hot: Hooray! A casual game for the PSP; Gets relatively addicting at times. What's Not: There isn't much to it for the price.